Home → What is the best grass seed? When considering sowing grass seed, it is important to ensure that the best possible seed has been selected. Obtaining healthy seed from a trusted supplier is a good first step but there are still many other considerations in selecting appropriate varieties for the site to be sown. It soon becomes clear that the question, “Which is the best grass seed?” has no definitive single answer. What is the Best Agricultural Grass Seed? Probably the most important consideration is the proposed purpose of the area of grass. In the world of agriculture, grass is grown as pasture for grazing animals and also as a crop for cutting to be used for silage or hay. High yields and nutritional quality are of course the top priorities and such grasses invariably include perennial ryegrass which is fast growing and has coarse leaves, fleshy stems and a high sugar yield. A suitable agricultural grass seed mix will usually include other varieties such as Italian ryegrass and Westerwold ryegrass which are quicker to establish but not quite as long-lived as the perennial variety. Timothy and cocksfoot grasses offer improved drought resistance and sometimes clovers are included. What is the Best Grass Seed for a High Quality Lawn? For a lawn where a perfect appearance is the top priority, a grass seed mixture of fine-leaved bents and fescues is recommended. Such a mixture could include brown-tip and highland bent mixed with Chewing’s fescue and slender creeping red fescue. In practice, a high quality lawn seed may include a mix of various similar small varieties but the most important thing is to choose a mixture which does not include any of the rather coarse ryegrasses. What is the Best Grass Seed for a Hard-Wearing Utility Lawn? Many lawns are subjected to heavy traffic such as occurs with areas used by children or pets and some grass species are better able to cope with such use. A typical seed mix for a utility lawn, which can still have a very good appearance, could include common bent, smooth-stalked meadow grass, red fescue, slender creeping red fescue and dwarf perennial ryegrass. What is the Best Grass Seed for a Sports Lawn? For bowling greens and golf putting greens, special mixes are available consisting of small, neat varieties along the lines of the high quality lawn seed above. For sports where greater wear resistance is needed, such as lawn tennis, a proportion of ryegrass is also required. What is the Best Grass Seed for a Problem Area? 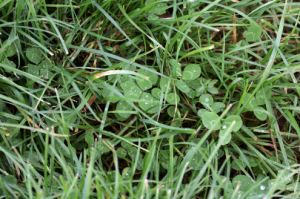 In some difficult areas, grass sowing may fail and many grass types will not grow successfully in damp or shady locations. These problems can often be overcome by choosing a mix of wood-meadow grass along with rough-stalked meadow grass and fescues. What is the Best Grass Seed for a Wild Flower Grassland? For many gardeners, the true beauty of grasses can be really be appreciated in a natural looking setting where long grasses can be interspersed with meadow flowers. When done properly, such a display may appear to have come about purely by chance but in reality a great deal of careful planning is required. Meadow flower seeds and even grassseed mixes containing flowers seeds are now available but other flowers can also be included in such a scheme with “naturalised” areas of spring flowering bulbs looking particularly effective. The choice of grass seed should be restricted to the native naturally occurring varieties. 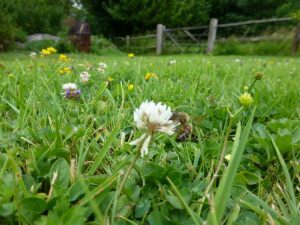 In recent years, seed from many of the old grass varieties has become available meaning that such wild meadow areas no longer have to be planted with the stock garden lawn varieties. Some of these grass varieties have charming and intriguing names and few gardeners could fail to be excited about the prospect of growing smaller cat’s tail, downy oat grass, crested hair grass or many, many more. The above advice on choosing the best grass seed does of course only apply to temperate areas and all of the grass species mentioned are regarded as being cool-season grasses. Such grasses grow best between 15 and 24 degrees Celsius. In some parts of the world, warm-season grasses are dominant and their methods of cultivation are often different with the sowing of a single species of grass seed often being preferred to the mixtures of cool-season varieties. Grasses are among the most numerous types of plants on earth. There are many thousands of different kinds including everything from wheat to bamboo. So which is the best grass seed? … Well it all depends!